Company secretary services in Singapore are essential for every business to function efficiently. Every company in Singapore must appoint a company secretary as per Company Law of Singapore. The appointment must be made within six months of registration. Some companies prefer to outsource the company secretarial service while some prefer to hire an in-house professional. In this article, we will highlight the importance of outsourcing professional company secretarial services. 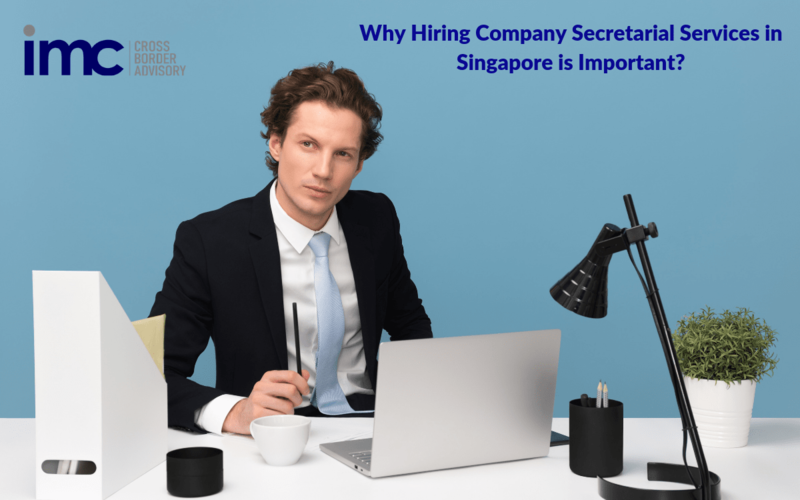 Why Do Companies Require Company Secretary Services in Singapore? Company secretary services helps a company in adhering to the rules and regulations of ACRA and avoiding any non-compliance. By outsourcing the services to a good agency, the company saves itself from the stress and burden of looking into the legal matters. The main advantage of outsourcing qualified company secretary services in Singapore is to foreign companies. Outsourcing the services will be cost-effective and they can also assist in the company formation in Singapore. So this way, a foreign company can get multiple benefits and assistance in various matters of the company. Debarment order against an individual restricts him to act as a company secretary of a company. The sole director of the Company can not act as a company secretary. A company secretary is required to fulfil the following duties and roles. He is responsible for updating and maintaining the statutory registers of the company. The company secretary must ensure proper usage of the company seal. The company secretary ensures that the company functions as per its constitution. He ensures that the company maintains its accounts as per the laid rules and regulations. He is also responsible for filing the returns of the company with ACRA. The company secretary prepares the minutes of the company and preserves them as per the law. The company secretary ensures that the company, its officers, directors and staff are insured. Various event based compliances like a change in the company’s registered office, an amendment to the company constitution, change in the director of the company, change in share capital, change in the name of company, charge creation, change in share capital, etc. must be responded by the company secretary. There are various other duties of a company secretary that he is expected to perform while serving for the company. Let us now have a look at the qualifications of Singapore Company Secretary. Before being appointed as the secretary of a public company, he must have worked as a secretary of a company for at least three of the five years. The above article will help you know everything about company secretary services in Singapore. If you are looking for a company secretary for your company, you may get in touch with IMC Group. We are a dedicated and an experienced firm offering company secretary services in Singapore. To avail our services, you can call us or mail us for further information. Ms. Rajee Maru operates out of our Singapore office as the Manager-Corporate Services. She had worked as a Corporate Secretary in the Indorama Group and Bradbury Management Consulting, Singapore. Her skills and experience include Internal Audit, Legal Assistance, Corporate Finance, and Legal Compliance. She is a Certified Company Secretary from The Institute of Company Secretaries of India and also holds a degree in Corporate Law. Rajee loves to explore new destinations, meet people, enjoys music and experiment with different cuisines.